When I survey the women of the New Testament, I find some remarkable women of faith, Mary the mother of Jesus (Luke 1:26-38) is the first to come to mind. But, there are others, such as Joanna, Susanna and Mary Magalene (Luke 8:1-3). Later on, I read about Priscilla who, along with her husband, risked her life for Paul (Romans 16:1-3). Then there is Lois and Eunice, a faithful mother and grandmother who instilled their faith in young Timothy (2 Timothy 1:5). Several are mentioned in Romans 16:1-16 and there are many more women I could site as well. However, there is one woman, who until recently, would not have made it into the top tier of my list (if she made it at all) and that is Martha, the sister of Mary and Lazarus. It is not because the scriptures do not present her as a faithful woman. Rather, it is because of my ignorance and misconceptions of this marvelous woman of faith. I would like share with you my fresh perspective on Martha. I want us to view her through the lens of faithfulness. Now, was she perfect? No. But who is? Contrary to my past view, Martha was a woman of deep faith, who loved her Lord and was loved by Him, and who is worthy of emulation. For our lesson, we will take an in-depth look the three passages where Martha appears Luke 10:38-42; John 11:1-44; and John 12:1-8. Then, at the end I’ll share two important lessons I learned from this fresh perspective on Martha. (39) Like any good hostess, Martha quickly got busy serving her honored guest and His companions. Instead of helping her sister Martha, Mary “sat at the Lord’s feet and listened to His teaching.” Perhaps she has started to wash His feet but never got up and continued to listen to Him teach. (40) Mind you, Martha would have been listening to Jesus teach but she was “distracted by much serving.” Note that she was not distracted with serving, but with “much serving.” It was not the basics of hospitality (cf. Luke 7:44-47) that distracted or troubled her (v. 41), it was her going above and beyond what was necessary, it was “much serving” that took her attention away from her Lord and caused her to snap at her sister. In her agitation, she “went up to [Jesus] and said, ‘Lord, do you not care that my sister has left me to serve alone?’” Martha was a good, thoughtful and faithful woman. She desired to show her special guest the best hospitality she could possible provide. She would have been at Jesus’ feet as well, if, in her mind there was not so “much” to do. I think this is at the heart of her frustration, she essentially asked Jesus, “Don’t You care that I can’t listen to You teach because Mary want help me get the work done around here. I have not had a chance to sit down all day. Tell her to help me so I can sit down and listen as well.” I have never gotten into trouble by simply supply the basics of life, it is when I go above and beyond, when I desire the much that I get myself into trouble. (41-42) Martha was obviously frustrated, yet Jesus did not respond as if she was hostile. 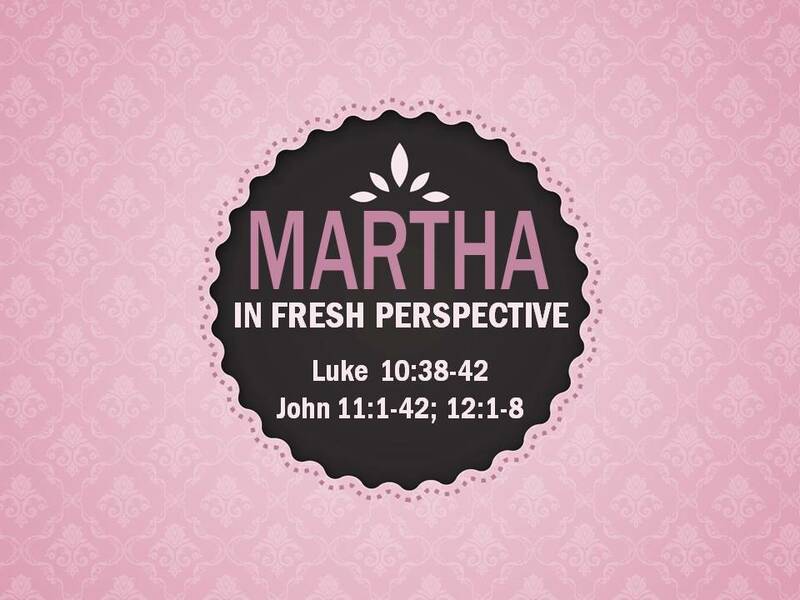 By doubling her name, “Martha, Martha,” Jesus expressed a loving concern to her outburst. This was not a “get behind me Satan” moment (cf. Matthew 16:23). Rather, it was our Lord tenderly correcting Martha by bringing her focus to where it needed to be. Martha was “anxious and troubled about many things” that she thought were necessary at that time not only for herself to be doing but Mary as well (cf. Luke 8:7, 14; 12:22-34). However, in Jesus’ eyes, “only one thing was necessary” and “Mary ha[d] chosen” it and it would “not be taken away from her.” That is, Jesus would not take from Mary her time with her Savior. It should be noted that Jesus didn’t correct Martha until she becomes critical of Mary. For me, that begs the question, why did Jesus do it then? I would submit that it wasn’t Martha’s service or caring about the needs of her guest that was wrong (remember she is a faithful, thoughtful, and caring woman); it was her attitude that was wrong and Jesus corrected her when it all come to a head. The words of 1 Peter 4:9 ring loud and clear in this scene, “Show hospitality to one another without grumbling.” That is what Martha was doing wrong in this passage, and her Lord and Savior brought her back to where she needed to be. I’ll have more to say about this passage in the latter part of this article. (1-5) John begins this remarkable passage by informing us that, “A certain man was ill, Lazarus of Bethany, the village of Mary and her sister Martha” (v. 1). He goes on to clarify that this is the same Mary “who anointed The Lord with ointment and wiped His feet with her hair” (v. 2; Matthew 26:6-13; John 12:3). The two sisters sent word to Jesus saying “he whom you love is ill” (v. 3). Instead of immediately rushing to Bethany, Jesus stayed where He was for two more days (v. 6) because, as He said, the “illness [would] not lead to death.” Rather, “it [was] for the glory of God, so that the Son of God may be glorified through it” (v. 4). As if to reassure his readers that Jesus’ delay was not out of a lack of concern, John adds, “Now Jesus loved Martha and her sister and Lazarus” (v. 5). It is interesting that Mary is not mentioned by name here and from John 11:2 it is possible that John’s original recipients did not know Mary by name. If that is correct, then it does appear they knew Martha since she is mentioned by name. (6-19) In the intervening verses, John records a discussion between Jesus and His disciples about going back to Judea, specifically in the vicinity of Jerusalem. Finally, after four days (v. 17) our Lord decided to go back to Bethany. Since Bethany was so close to Jerusalem, a suburb really, many Jews had come to console Martha and Mary (vv. 18-19). (20-27) As Jesus approached Bethany, Martha heard that He was coming and eager to be with her Savior, “she went to met Him” while “Mary remained seated in the house” (v. 20). The conversation that transpired between Martha and Jesus demonstrates the depth of her faith. “Lord, if you had been here, my brother would not have died” (v. 21). This was not a rebuke of Jesus, but a testimony of Martha’s unwavering trust in Jesus’ healing power (compare v. 32). With ironclad trust, she confidently added, “But even now I now that whatever you ask from God, God will give You” (v. 22). She believed in Jesus’ special relationship with God, which becomes even more evident in v. 27. At this point, I envision Jesus reaching out and putting a hand on Martha’s shoulder and saying, “Your brother will rise again” (v. 23). Misunderstanding the Lord’s timetable, Martha faithfully replies, “I know that he will rise again in the resurrection on the last day” (v. 24). Martha’s belief in the final resurrection was in keeping with the beliefs of the Pharisees (Acts 23:8) and the majority of first-century Jews, as well as the teachings of Jesus (John 5:21, 25-29; 6:39-44, 54). Nevertheless, Jesus wanted Martha to move from an abstract belief in the resurrection to a belief based on Him as the resurrection and life. For Jesus time was no barrier, for He can give life at any time. Therefore, He said, “I am the resurrection and the life. Whoever believes in Me, though he die, yet shall live, and everyone who lives and believes in Me shall never die. Do you believe this?” (vv. 25-26). Martha replied with what is commonly called the good confession, “Yes, Lord; I believe that you are the Christ, the Son of God, who is coming into the world” (v. 27). Martha’s acknowledgment of the Messiahship of Jesus is representative of the very reason John wrote his gospel (John 1:49; 4:42; 6:69; 9:35-38; 20:28-31). Moreover, Martha’s confession that Jesus was the Christ put her in a special group of believers as far as the gospels are concerned. (28-31) After her conversation with Jesus, Martha departed “and called her sister Mary, saying, ‘The Teacher is here and is calling for you’” (v. 28). Upon hearing this, Mary “arose quickly and went to Him” (v. 29). Because of the quickness with which she departed the house, and the direction she went, many of the Jews thought she was “going to the tomb to weep” (v. 31). Therefore, like any good comforters “they followed her” (v. 30). (32-37) Mary’s first response was to “fall at [Jesus’] feet” (v. 32) (Mary is always pictured at Jesus’ feet Luke 10:39; John 12:3). Following suit with her sister Martha, Mary states, “Lord, if you had been here, my brother would not have died” (v. 32; see note on v. 21). She must have said this through heavy tears, fore “when Jesus saw her weeping, and the Jews who had come with her also weeping, He was deeply moved in His spirit and greatly troubled” (v. 33) and requested to be taken to the tomb (v. 34). It is at this point John recorded those immortal words, “Jesus wept” (v. 35; cf. Luke 19:41). His heart broke for Martha, Mary and the Jews who were mourning the death of their friend and loved one Lazarus. “See how He loved him!” (v. 36) someone exclaimed. However, others retorted “‘Could not He who opened the eyes of the blind man also have kept this man from dying?’” (v. 37; cf. John 9:1-41). In contrast to the unwavering faith of Martha, these Jews doubted the sincerity and power of Jesus. (38-44) As Jesus approached the tomb, He was “deeply moved again” (v. 38) by the emotion of the moment and the mourners who stood nearby. To setup the scene that follows, John briefly describes that Lazarus was buried in “a cave and a stone lay against it” (v. 38). Standing in front of the tomb, Jesus commanded that the stone be “taken away” (v. 39). However, being the practical woman she was, Martha spoke up, reminding the Lord “by this time there will be an odor, for he has been dead four days” (v. 39). Martha’s protest seemed reasonable. Although the Jews used aromatic spices in their burial practices to mask the smell (cf. John 20:30-31), spices could only do so much, and after four days, the odor would have been strong. Nevertheless, Jesus wanted the stone removed as a sign of her faith questioning, “Did I not tell you that if you believed you would see the glory of God?” (v. 40). The Lord called Martha’s attention back to what He had said to her just moments ago. She believed that Jesus was powerful enough to have healed her brother and to have any request fulfilled by God, now she must believe He is powerful enough to raise Lazarus from the dead. At this point her “faith was completed by [her] works” (cf. James 2:22) and she gave the command for the stone to be removed (v. 41). Upon Martha’s demonstration of faith, Jesus offered a prayer of thanksgiving to the Father (v. 42). John records that “when He had said these things, He cried out with a loud voice, ‘Lazarus, come out’” (v. 43). Lazarus “came out” with “his hands and feet bound with linen strips, and his face wrapped with a cloth. Jesus said to them, ‘Unbind him, and let him go’” (v. 44). The power and the importance of Martha’s faith as recorded in this passage cannot be understated. She made the good confession of Jesus’ Messiahship. By faith, she ordered the stone covering Lazarus’ grave removed. By faith, she received her brother back from the dead. Did she waffle at first? Perhaps. But her removing of the stone demonstrated her deep faith in Jesus. Moreover, it was Martha’s faith that made possible the resurrection of her brother (compare other miracles where the faith of another precipitated the miracle Mark 9:21-27; Luke 5:17-26; 7:1-10; 8:40-42, 49-56). Martha was a woman with a deep and strong faith. Did it waver some? Sure, but whose faith doesn’t? Nevertheless, we must concede it was her faith that was the foundation of this great miracle. Please make sure you see that. (1-2) In connection with our previous vignette, John brings us back to Bethany to the house of Simon the leper (Matthew 26:6; Mark 14:3) where a feast was being held in Jesus’ honor, a mere six days before His death (v. 1-2a; John 13:1; 19:14). The two sisters, Martha and Mary, appear again exactly as they did in Luke’s depiction of them (Luke 10:38-42). Martha is serving her guest (cf. Romans 12:13; 1 Timothy 5:10), Mary is at the feet of Jesus (v. 2b) and their brother Lazarus is reclining at the table with His Lord (v. 2). I do not believe that the words used by John are by accident. John mentions Martha and her serving for a reason. I believe he wants show this great woman possessed a servant’s heart. She chose to serve when her and her family was the guest of honor. That is a powerful example and worthy of emulation. While the subject of this article fades into the pages of the Bible, I’ll still explain the rest of this passage. (4-6) At the sight of this extravagant act of adoration, Judas (v. 4) and the other disciples (Matthew 26:8) “indignantly” (Mark 14:4) asked, “why was this ointment not sold for three hundred denarii and give to the poor?” (v. 5). The value of the ointment Mary used was roughly equal to the yearly wage of a laborer (cf. Matthew 20:2). John adds that Judas did not say this “because he cared about the poor, but because he was a thief” and “used to help himself to what was put into [the moneybag]” (v. 6). (7-8) Jesus comes to Mary’s defense saying, “Leave her alone, so that she may keep it for the day of my burial” (v. 7; cf. Matthew 26:10-12). Matthew adds, “Truly, I say to you, wherever this gospel is proclaimed in the whole world, what she has done will also be told in memory of her” (26:13). Jesus did not think that Mary’s gift was wasteful, but a loving act of adoration. He ends by reminding the disciples, “the poor you always have with you, but you do not always have Me” (v. 8; Deuteronomy 15:11). The point being, Jesus will not be among them very much longer. Therefore, they should not complain about such an extravagant gift, especially one that alludes to His impending death. While Mary is the central focus in John 12:1-8 (this is the only passage where she is the focus), we do see Martha doing what she did best, serving others. Martha was a great woman of great faith that was coupled with a servant’s heart. Sadly, for a long time, I have simply made my conclusions about Martha, and by extension Mary, based on Luke 10:38-42 and frankly, this passage alone. In my mind Martha was bad, Mary was good. As I’ve learned there’s more to Martha than what is presented in Luke 10:38-42. As I explored the scriptures, I discovered her great faith in the power of Jesus in John 11 and I did caught a glimpse of her as she zipped by in John 12:1-8 serving the needs of others. I discovered, as I hope you’ve seen as well, that Martha was a great woman of faith, who loved others with her servant’s heart, worthy of being near the top of anyone’s list of faithful women. Now I would like share with you two major lessons I learned from how I have treated Martha in the past. Lessons that I hope, will impact you in your daily life as well. I truly believe that our approach to Martha is indicative of how we treat others. Don’t judge others based on one moment in their life. The first valuable lesson I’ve learned from my study on Martha is don’t judge another based on one moment in their life. I’ve done that with Martha. I identified her solely as the woman who got rebuked by Jesus in Luke 10:38-42. What was I doing? I was judging her based on that one instant in her life. What struck me is I don’t do that with other like Peter (Mark 14:66-72; Galatians 2:11-13); or Barnabas (Galatians 2:13) or John Mark (Acts 13:13; 15:36-41). It just seems to me that in many of the sermons I have preached or have heard, or in the bible studies and books I have read, Martha is presented as the poster-girl for all that is bad in Christians, especially women. Case in point, when I preached this lesson for my congregation, one of the older sisters came up to me and said she’s heard a lot of preaching on Martha through the years but this was the first positive sermon she has ever heard about this great woman of faith. Friends, that’s just sad. Furthermore, this sister said she hadn’t ever even noticed Martha’s role in the raising of Lazarus. It’s not right of me, or you, or anyone else to judge a person based on one moment in their life. And you know what? If we will do that with Martha, faithful Martha, then there is a good chance that I, or you, will do it to Nancy two pews away; or Joe at work; or Sally in the neighborhood. Well judge them as unfaithful, or less than worthy of our consideration because of one bad scene in their life. Let’s not forget the golden rule, “So whatever you wish that others would do to you, do also to them” (Matthew 7:12). I don’t want anyone judging me based on one moment in my life and believer me there’s plenty of them to pick from. I want them to look at the totality of all that I have done before they make a judgment call about who I am. And I think you would want the same done for you. So, then we need to treat others that way, including Martha. Remember, nobody is at their best all the time, nor are we always at our worst all the time. Don’t judge a person based on one moment in their life, step back and take in the whole panorama of who they are as a person before you make a judgment call about what kind of person they are. We don’t have to have the same personalities to be faithful. The second lesson I learned from my study of Martha is that we don’t have to have the same personalities in order to be faithful. Unfortunately, when these two sisters are studied together, a false dichotomy is drawn between them based on personalities. I’m told (as well as so many of my sisters) that it is so hard to have a Mary heart in a Martha world. By that expression alone Mary is exalted as the ideal and Martha is relegated to something that must be shunned. I see Martha and Mary in this list of God-given talents. Martha serves, Mary gives, and both were to do so “according to the grace given” to them by God. Therefore, there is no need for us to have the same personalities in order to be faithful. For too long, I didn’t see that. I presented Mary as the ideal woman of faith, and denigrated Martha as a less than desirable woman of the scriptures. I did this because I had never considered the whole story of Martha and had simply focused on Luke 10:38-42. Thankfully I’ve seen the light on this great woman of faith and now know we don’t all have to have the same personality to be faithful. I hope that my journey to discovering the true Martha has helped you in your understanding of this great woman of faith. Let’s keep searching the scriptures to uncover God’s truth for ourselves. If I can help you in your spiritual journey please email me at clay@claygentry.com. Until next time, keep sharing the good news.